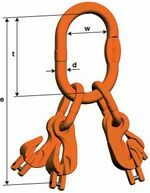 XKW shortening hooks for the assembly of IV-leg chain slings in the assembled system will not be budged! The hook functions both as a connecting link and a shortening element – multi-functional in the true sense of the word! The set is manufactured according to EN 818‑4 with the mechanical values of G10 and come with a CE-marking for certified quality and BG-approval. A full operating manual and the KBSW spare parts set consisting of coupling pin and lock pin are also included in the delivery. Example: VXKW 4-10 may be used for IV-leg chain slings with a 10 mm chain.